Learn how to make the best scrambled eggs with a little bit of science. 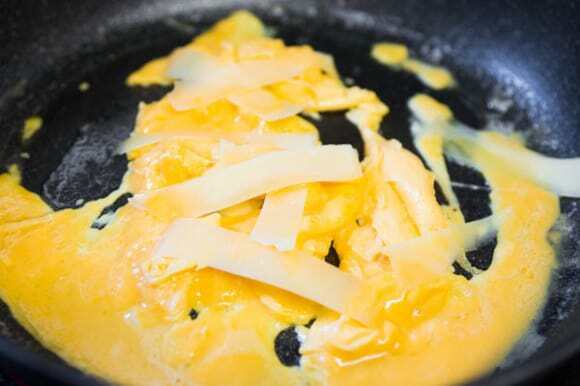 This scrambled egg recipe shows you how to make scrambled eggs like a pro. Scrambled egg is often the first dish we learn how to make, yet for many it’s one of the hardest dishes to master. While everyone has a different ideal of what scrambled eggs should be like, I can’t help but smile when I’m served a plate of tender golden yellow curds that somehow manage to defy contradiction by being light and fluffy, yet rich and decadent. The trick to getting fluffy eggs isn’t about what you add, or how you beat them; it’s about how you cook them. When the water in eggs come in contact with a hot pan, it heats up and evaporates; this naturally creates tiny bubbles of steam in your egg. Voila! Fluffy eggs! Simple right? Well that’s how it works in theory at least. 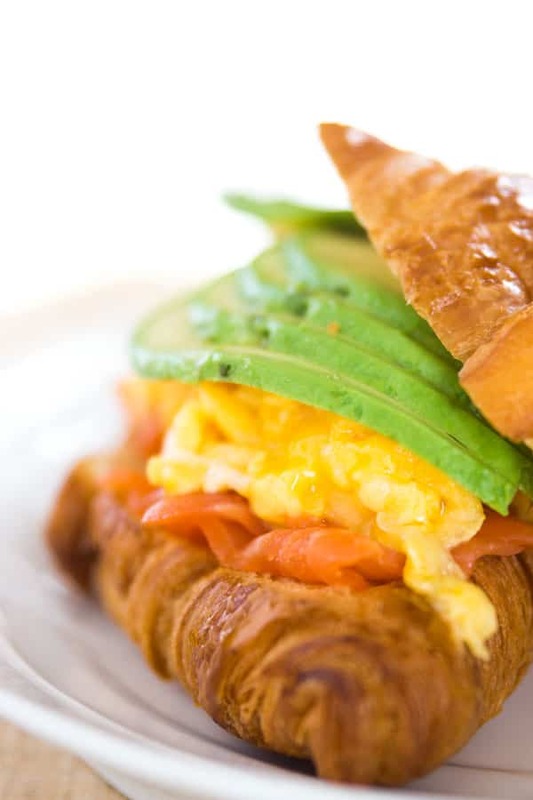 You can make the sandwich pictured in the photos by cutting a croissant open, toasting it, then adding a layer of smoked salmon, your scrambled eggs, and some thinly sliced avocado. It’s decadent, but makes for a protein packed start to a day. 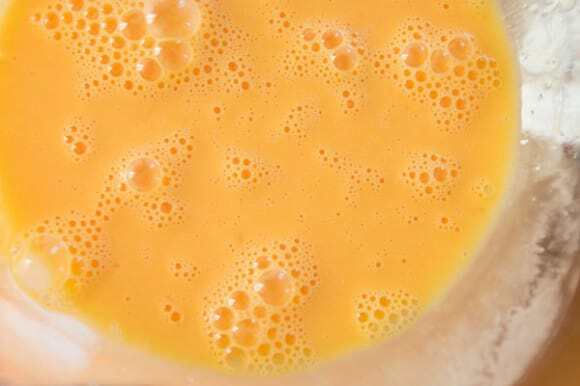 Put the eggs, cream and salt in a bowl and beat with a fork until the whites and yolks have just combined. 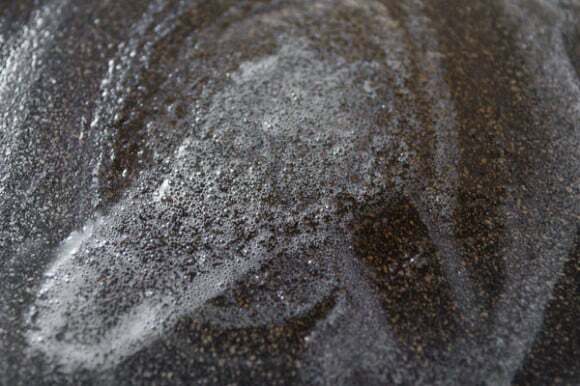 It's okay if there are some bubbles on the surface but you don't want foam, so avoid using a whisk. Add the butter to a non-stick frying pan and heat over medium low heat and melt the butter evenly around the pan. You want the pan to be evenly heated, but you don't want it to be too hot. You can tell when the pan is ready when the butter starts to sizzle. Pour the egg mixture into the center of the pan, and let it spread out on its own. Don't stir it yet. You'll notice that as the bottom layer of egg cooks, it goes from translucent to opaque. When the bottom layer of egg has firmed up, it's time to stir. 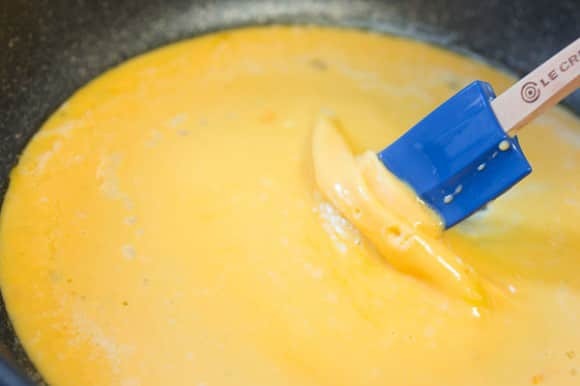 Use a heatproof silicone spatula, and gently gather up the curds, allowing the upper layer of uncooked egg to flow under the cooked egg. Wait again for the egg to start looking a little opaque again, then stir and add the cheese, this time continuing to stir. Remove the eggs from the pan just a bit before you feel like it's done. 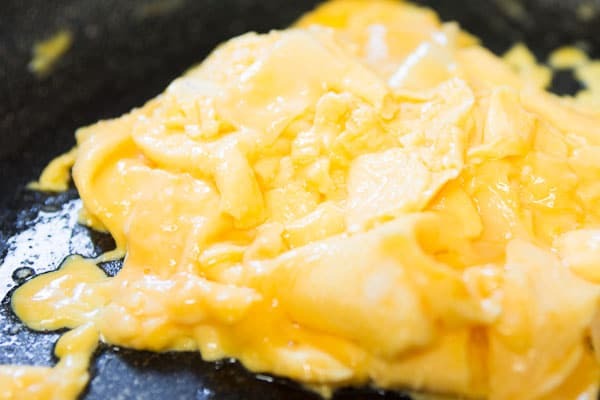 Personally I like my eggs on the soft side, so I take them out of the pan as soon as the cheese melts, the eggs are still glistening, and there is no runny egg left. wow these scrambled eggs look so fluffy and creamy. I prefer to add cream instead of milk because milk doesn’t give you that creamy soft result. I sometimes use half and half to make a “healthier version”. Thanks for sharing the detailed tips. Very timely post – I just recently had a discussion with friends about making good scrambled eggs. And that sandwich looks amazing. So basic but seriously, it’s a skill. I like my scrambled eggs with that “wet” look. I just ca’t stand dried up scrambled eggs (which is why I never order them in a restaurant). It took me awhile to figure out how to make perfect fluffy eggs as well. I found that keeping it simple – eggs and a bit of water scrambled together and gentle cooking works every time! Have you tried making them in a bain-marie? I just use a steel bowl and medium sauce pan. Works well because the temperatures of the bowl are more gentle on the proteins than using a saute pan. When I’ve done this, I always ended up with a very light texture and fluffy creamy eggs. In the Rex Stout’s Nero Wolfe detective mysteries Wolfe says that proper scrambled eggs take 45 minutes. I don’t think it goes into detail about how he makes them, but in the cookbook Stout wrote he cooks them in a double boiler. I’ve never tried it in a bain-marie, but I’ve done them sous-vide which gets similar results. Yeah, I’ve read about doing it sous vide. Thinking I should pick up a used thermocirculator. I’ve done slow poaching with a stock pot and ice cubes, but it really demands too much attention. It would be great just to see with my own eyes the different coagulation temps for each of the different proteins in the egg. Love this post! Starting from its title 🙂 The more a dish is simple, the more every single step matters. Thanks for sharing your tips! Love the post! I grew up eating eggs that were much more cooked, which is why I favored “sunny side up” instead of scrambled. Nowadays when I make scrambled eggs I shoot for the same consistency that you have in the post. But as much as I love scrambled eggs my favorite is still cutting into a perfectly cooked soft poached egg, letting all the golden yolk run on the plate (like in your polenta and egg recipe)! I know exactly what you mean. I used to dread scrambled egg day because they were always like eating plastic. Poached eggs are my favorite too. I’ve got a post coming up on getting perfect poached eggs every time. While I’ve never done it this way, I imagine using a bain-marie would yield amazing eggs (similar to sous vide scrambled eggs). That said, the beauty of scrambled eggs for me is that they’re a quick breakfast when you don’t have a lot of time, which is why I still prefer to do mine in a frying pan. What a great post. Going to pass this along to my husband. He makes eggs a few times per week and always offers some to me. His eggs are not pretty, nor tasty and I hope he follows your fabulous advice. I’m looking forward to trying this way of cooking eggs in the morning. Sounds delicious! I’ve recently abandoned the non-stick pan for a ceramic-coated cast-iron pan, which I love for scrambled eggs. I’ve been playing with starting out with a very hot pan and turning off the burner right after adding the eggs. I’ve been enjoying the results, but then again I like my eggs a little more cooked than you. I am looking forward to trying your method for a softer egg. Thanks for another thoroughly explained recipe! Ever tried the Nero Wolfe method? 40 minutes in a double boiler? I thought for sure it would be an excuse to unearth the ol’ double boiler. KISS, with egg breath! Yep, I could never make scrambled eggs, figured it just wasn’t my thing. Hubby could always whip up a decent batch & for years I’ve regulated the task to him. Never really thought much about it until I read your “how to” this morning. Having all ingredients on hand (including those for the lovely sandwich), I put your instructions to the test. Viola! I can make fluffy scrambled eggs! Many thanks, Marc! One word… induction. I just got an induction cooktop and I freakin love it! If I want to substitute cream with milk how much milk should I use? Hi Miss Ody, you can substitute for the same quantity of milk for lighter scrambled eggs. Me too. I think I read years ago that James Beard suggested a touch of water to make them the fluffiest, so I’ve been doing that ever since. Hi. I received an expensive pan for cooking my eggs. It is not nonstick. Do I still cook the eggs the same way? Hi Mark, yes these instructions are for a non-stick pan.